Inspired by Eddie Muller's thoughts on who was the best at playing Raymond Chandler's Philip Marlowe, I came up with my own list. 3. Powers Booth- (Philip Marlowe, Private Eye TV Series 1983 & 1986) Didn't look the part, and maybe carried too much mischief in his voice, but the series really tried to capture the essence of film noir, and Booth was believable. 4. Robert Mitchum- (The Big Sleep-1978 & Farewell My Lovely-1977) Both were crappy movies with a creepy 70's vibe, and Mitchum was just too old to save these stinkers. 5. George Montgomery- (The Brasher Doubloon- 1947) Looked and acted like a poor man's Clark Gable. Nothing like Marlowe. His mustache didn't work either. 6. Philip Carey- (Philip Marlowe TV Series 1959-60) Looked the part, but didn't pull off the inner turmoil of Marlowe. Too squeaky clean. 7. Robert Montgomery- (Lady in the Lake-1946) What could have been a good movie, was poorly cast, and shot from Marlowe's perspective. Which means Montgomery really had little screen time in the film. He didn't look or act the part. It should be remade, but not in the same style. 8. James Garner- (Marlowe-1969) Terrible film with a hippy influence. Garner is a fine actor, but Philip Marlowe was never meant to sport shaggy hair and sideburns. 9. Elliot Gould- (The Long Goodbye-1973) Although the film had too much early 70's influence, it was not a bad movie. But, Elliot Gould was without doubt the worst Marlowe ever. His shaggy frumpy appearance was bad enough, but he also mumbled threw the entire dialog. Totally aloof. 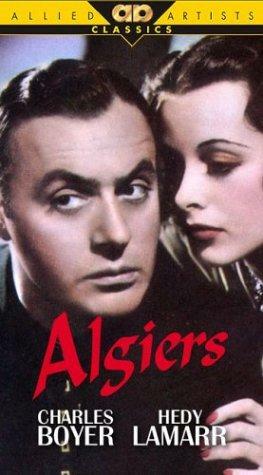 Not really a noir, but Algiers will air at 5am central time zone on Thursday the 21 on TCM. Viewed as the original "Casablanca", the film follows the relationship of a romantic jewel thief (Boyer) and a beautiful French tourist (Lamarr). Set in the Casbah quarter of French occupied Algiers. I recently watched "The Narrow Margin" for the first time. Wow! It was great. Perhaps the best B movie ever made. Better than most "A" films released at the time. Next time it's airing, I'll be sure to post it. Crime Story, a cop series base on the early 1960's Chicago crime and corruption problems, is now available on-demand on Pluto. I loved the series back in the 1980's when it first hit the air on NBC. The show has some procedural issues, but overall is a great series. The title also features a great reworked version of the hit song Runaway by Dell Shannon. I recommend the series to anyone that likes period crime drama. Pluto has reworked their interface and made it much more inline with what Netflix has. If you have not yet downloaded Pluto, you should. The on-demand content alone makes it worth having. Plus it is free. Thank you. I had not seen this site before. There are some good films on there.